In days gone by wedding dress fabrics used were velvet, damask, silk, satin and fur with gold and silver threads used for embrodery patterns. In today’s modern world we have an array of beautiful materials that can turn any pattern into breathtaking gowns that are sure to make any blushing bride feel like a princess when wearing one as she is floating down the aisle. Fabrics, like the weather, change with seasons and dresses worn in the summer months will be made from much lighter and softer fabrics than winter wedding brides will normally wear. This should be taken into consideration if you are contemplating making your own wedding dress. 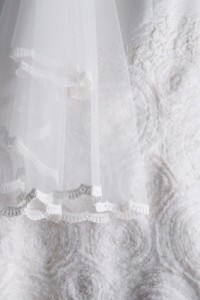 The following is a short list of some of the more common fabrics used in wedding dresses. Chiffon : one of the floating romatic fabrics with a simple weave of silk and rayon. There is also a less expenisve version made with polyster-silk blend. This material can be soft or have a stiff finish, it is usually produced in delicate sheets and often drapped in layers. Satin : a silk or synthetic blended material with a smooth usually shiny and glossy unbroken surface. The luxurious material is formed with a satin weave using filament such as silk, nylon or polyester. Taffeta : crisp, smooth, glossy fabric in silk or silk blends; small crosswise web; good body and rustle; year-round fabric (tissue-weight). This crisp and smooth fabric is woven from silk or synthetic fibres. Its origin comes from Persian and means ‘twisted woven’. One of the high end fabrics that are suitable for ball and wedding gowns although there are two distinct types of taffeta, one tied-dyed is softer than the much stiffer yarn-dyed taffeta. Crêpe : a fabric which is soft flowing with a crinkled texture and is popular for bride and bridesmaids alike. This thin floating material can be cut on the bias creating a flattering silhouette for slim shaped bodies. Batiste : soft, delicate summer fabric made of cotton, cotton-linen or cotton-polyester blend; fine and sheer texture; usually pure white. Silk : a natural fibre and one used most often in wedding dresses. This light and floaty material is known for its lustrous shine. Multiple layers such as chiffon, tulle and organza silks can be used giving that transparent yet lightweight look and feel. Spring, summer or autumn is the best time to wear this material. Any dress made from this fine crepe-like texture will add a softer silhouette to any gown. 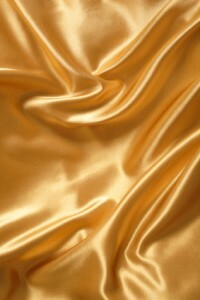 Dutchess Satin : a beautiful smooth, glossy and natural fabric with a rich and lustrous finish. Because this material is one of the heaviest it can be more suitable for the cooler seasons. Any dress made with this fabric will look simple yet stunning and adding embellishments will only enhance the look. Brocade and Damask : are both heavier fabrics usually interwoven with embossed designs and ideal for those winter weddings. This richly patterned fabric has always been associated with luxury and opulence. A rich satin weaved material gives a reversible positive/negative image pattern. A fabric that is Ideal for the bride who is getting married in a castle or having a medieval themed wedding. Georgette : a silk or synthetic crepe with dull texture and Illusion of silk tulle or nylon material that can be used for veils. Linen : from flax; beautiful, durable, elegant with natural lustre, usually blended to reduce wrinkling; used for spring and summer weddings. The same dress but made from different materials can look vastly different, while one type of fabric can produce a light fluffy flow line another can make the dress appear stiff and unyielding.